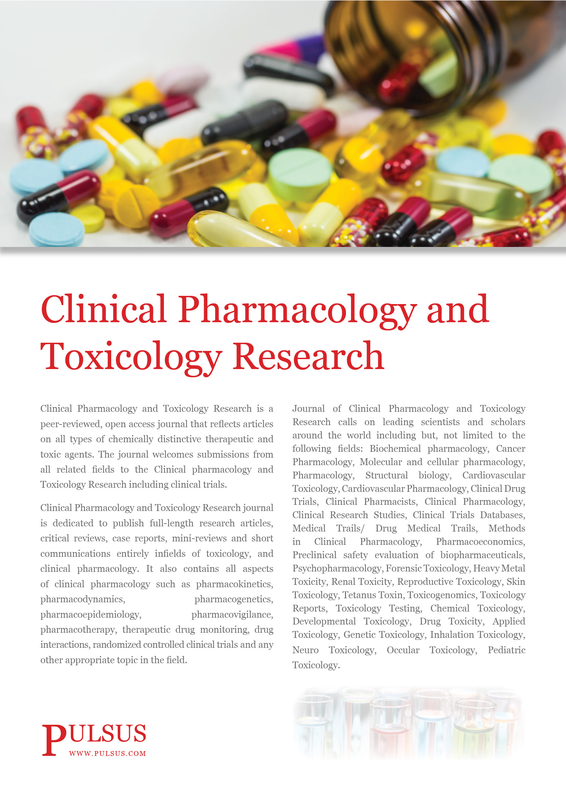 Clinical Pharmacology and Toxicology Research is a peer-reviewed, open access journal that reflects articles on all types of chemically distinctive therapeutic and toxic agents. The journal welcomes submissions from all related fields to the Clinical pharmacology and Toxicology Research including clinical trials. Clinical Pharmacology and Toxicology Research journal is dedicated to publish full-length research articles, critical reviews, case reports, mini-reviews and short communications entirely infields of toxicology, and clinical pharmacology. It also contains all aspects of clinical pharmacology such as pharmacokinetics, pharmacodynamics, pharmacogenetics, pharmacoepidemiology, pharmacovigilance, pharmacotherapy, therapeutic drug monitoring, drug interactions, randomized controlled clinical trials and any other appropriate topic in the field. Journal of Clinical Pharmacology and Toxicology Research calls on leading scientists and scholars around the world including but, not limited to the following fields: Biochemical pharmacology, Cancer Pharmacology, Molecular and cellular pharmacology, Pharmacology, Structural biology, Cardiovascular Toxicology, Cardiovascular Pharmacology, Clinical Drug Trials, Clinical Pharmacists, Clinical Pharmacology, Clinical Research Studies, Clinical Trials Databases, Medical Trails/ Drug Medical Trails, Methods in Clinical Pharmacology, Pharmacoeconomics, Preclinical safety evaluation of biopharmaceuticals, Psychopharmacology, Forensic Toxicology, Heavy Metal Toxicity, Renal Toxicity, Reproductive Toxicology, Skin Toxicology, Tetanus Toxin, Toxicogenomics, Toxicology Reports, Toxicology Testing, Chemical Toxicology, Developmental Toxicology, Drug Toxicity, Applied Toxicology, Genetic Toxicology, Inhalation Toxicology, Neuro Toxicology, Occular Toxicology, Pediatric Toxicology. The journal policy is to publish work considered by peer reviewers to make useful contributions to the field.